Between polar caps cracking, volcanos erupting, and out-of-control bovine, it feels like the end of the world as we know it. But you know what? We feel fine. 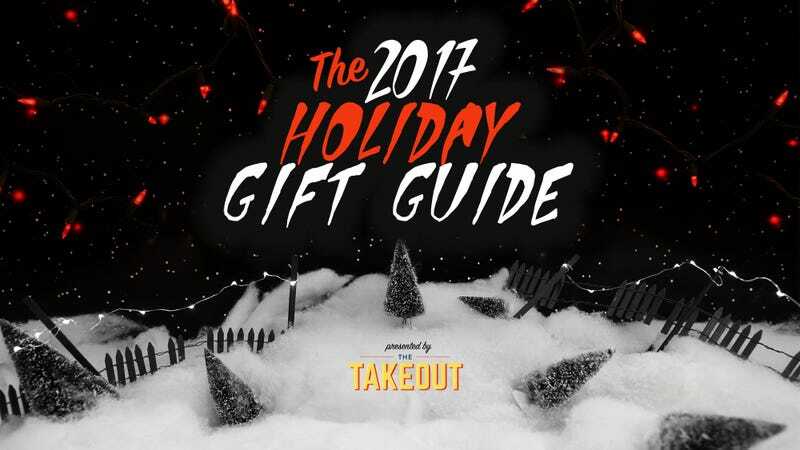 Here at The Takeout, we’ve hand-selected 11 food-and-beverage holiday gift ideas to help us all navigate this new world order. Or perhaps you’re not as cynical as we are, then the following makes pretty darn good presents too. You’ll need sustenance, son. You’ll need protein, and it will need to last for the long haul. Beef jerky is the solution, and we’ve encountered no better-tasting jerky in the past year than the ones made by No Man’s Land in Boise City, Oklahoma. On the spectrum of moist vs. dry jerky, No Man’s Land leans heavy on the latter, producing a hearty chew that imparts the smokiest, beefiest, most savory flavor. If you seek teriyaki or sweet chili-ginger innovation, there are other purveyors exploring newfangled flavors. No Man’s Land beef jerky is classic, no-nonsense, and all brawn. As we head west after the nuclear holocaust, seeking warmer climates and other survivors, it would be nice to have a cold drink of water along the way. This is assuming we’d survive “roughing it,” which is highly unlikely, but if we did—we’d suggest a Hydro Flask by your side. “Why on earth would you pay 30 or more pre-apocalyptic dollars for a water bottle? !” you ask? Well, it’s the best water bottle on the planet. It’s lightweight, comes in a variety of colors and sizes and most importantly—keeps your water cold for hours. Before we sacrificed our vehicle for scrap metal and roughage, we left this bottle inside a hot car on a 90-degree day for more than three hours and returned to have a sip of ice cold, delicious H2O. Those were the days. To ease that incessant dull pain in your stomach, the one caused from dread, anxiety, and rancid scraps found along the road (Cormac McCarthy’s The Road, that is), may we suggest the most effective elixir of all: ginger beer. As ginger beer obsessives, we’ve purchased, tasted, and mail-ordered every brand, and none can touch Rachel’s Ginger Beer, a company that’s achieved mythic status in its hometown Seattle. Brewed with simply lemon, sugar, ginger, and water, Rachel’s more-refreshing-than-ginger-burn beers are pure alchemy—and not surprisingly, it produced the best Moscow Mule we’ve ever sampled. May we direct your attention to the original flavor, white peach, and caramelized pineapple. So there is no food to be found. Close your eyes, then, and picture the bounties of yesteryear, and play this card game that imagines you as a chef preparing the most sumptuous meal. Co-created by the artistic director of Cards Against Humanity, Competition Kitchen is a game where players draw ingredients cards and are tasked with concocting, on the spot, a dish based on a challenge of the particular round. It is essentially a Top Chef quick-fire challenge without the messiness and perishable foods. Unfortunately for you, a remnant of humanity, this game makes you terribly hungry. Let’s comfort ourselves with butter, shall we? But not just any butter—copious amounts of grass-fed, delicately flavored, slow-cultured fancy butter, delivered straight to your door and mouth. Banner Butter is made from Georgia-raised cows free of antibiotics and hormones, and it boasts a higher butterfat content (a.k.a. deliciousness content) than most butters. Each quarter, you’ll receive four blocks in seasonal flavors such as sea salt, balsamic fig, and lemon chive. Be forewarned: These may lead to increased artisan baguette purchases—if bakeries still existed. If your days are numbered and you’re hunkered down in your safe room with a few slices of bread remaining, be sure to make yourself some toast that will bring you a rare moment of pleasure: By slathering it with the world’s most delicious jam. If you haven’t been to Sqirl in Los Angeles, you are missing out. The ricotta toast! The pesto bowl! The iced cappuccino! But you can get some of Sqirl’s life-altering jams delivered to your house. All jams are made at the Silver Lake restaurant, in copper jam pans with fresh, seasonal produced that is blessed by California sunshine. And pick up Jessica Koslow’s excellent cookbook while you’re at it. Coffee... coffee... where, good God, where?! In this handsome Phaidon collection, 150 experts in 50 countries recommend their 600 favorite places around the world worth visiting for a solid brew. Soon the jitters you experience round-the-clock will come only from the coffee. This apron’s heavy-duty duck canvas material withstands spills, blood spatter, gunpowder, gale-force winds, and other modern inconveniences while a subtle green-grey color ups the military appeal. Ample front pockets safely store scissors, rations, or bear spray. The apron is fully adjustable and features reinforced brass as its most-used corners, keeping you looking great in your wood shop or traveling along Fury Road from Mad Max. Either way, you’ll appreciate the handy hammer loop at hip level. Goth’s mainstreaming has finally reached the bar cart, a logical place for the dark and brooding to congregate. Cocktail Kingdom’s collection of matte black jiggers, bar spoons, and strainers are professional-grade tools best used to whip up such cheery favorites as Corpse Revivers, Zombies, and Blood and Sands. (I’m especially enamored with the skull barspoon, developed with tiki legend Jeff “Beachbum” Berry.) Pair these with Death & Co.’s cocktail book for a mortality-themed gift any drunkard would appreciate. Melding both childhood and adulthood favorites into one convenient package, Tipsy Scoop’s ice creams are infused with liquor—not an overbearing amount, but enough to achieve a lovely boozy undertow amidst the creamy familiarity (the Santa’s Cookies and Whiskey lists a 5 percent ABV). If it’s served at a bar, chances are you’ll find it in ice cream form here: holiday spiced eggnog, chocolate stout pretzel, cake batter vodka martini. Anything to numb the pain, especially when it’s 135 degrees outside.